Ladies, how many times have you spent hours getting ready for a night out? Making sure your hair is just right and you’ve got the perfect smokey eye going on. Halfway into the evening, it’s like all of the hard work has been undone. By the end of the night, we’re channeling our inner Alice Cooper. That little clutch we’re carrying is only going to hold our phone, debit card, twelve bucks in cash max, and hopefully some lipstick. This is why we need a friend like Arnetta Lawrence, a 33-year-old medical assistant from Merrillville, Indiana. She doesn’t need a purse, she IS the purse. 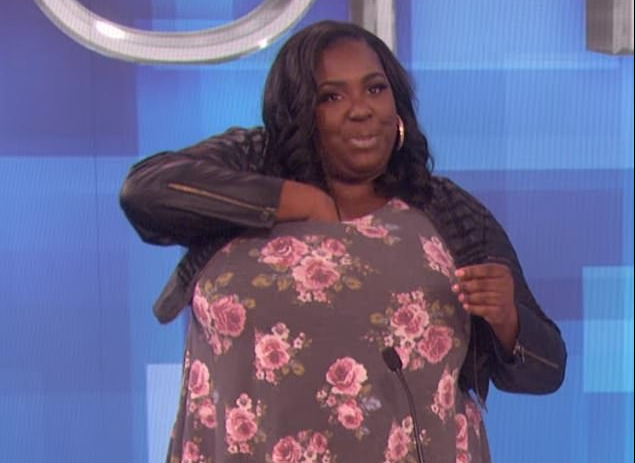 She was on The Ellen Show recently showing off her unique talent of carrying various essentials in her bra, just in case a BFF is hankering for some tater tots, or a shot of tequila. Those are just a couple of items that she smuggles in her bra. Arnetta is there for her friends when they need a bit of “freshening up.” She carries body spray and deodorant. While getting a cardio workout because we’re dancing so hard, our hair is a hot mess now. No worries, Arnetta is there with a brush and a flat iron. I’ve never met this woman, but I need her in my life.